It will be revealed tomorrow. Will we be killed for attempting to escape? 18th May, 1:30 pm GMT! We can keep the date the same! Start studying, kids, because this will test everything you know about the game. Good luck ! Yep! Although your job won’t start for a while. I estimate it will be at least a week after the opening that people begin to escape. Yes, since you are a mod. Will u come on now? I’ll be joining, and finishing my hotel soon. Yay someone likes my “pixel art”! I can’t believe we are still opening on the 18th! I couldn’t ask for better fans. The hype on this thread is amazing. Every day I wake up to many notifications from the staff pm or this topic. I’m so happy we are releasing on the 18th, and hope to see you all there on the opening day. 1:30 , everyone! Start sharpening those swords and prepare for quite possibly the hardest but most exciting game of your life. It might even get 16 players. Can’t wait to see what’s on the server feeling so hyped. Wonder how the escape will be. Also what’s the reason for escaping? Like is there disaster? Demand? Uprest? Oh yeah, and you’re trying to see the sun or something too. 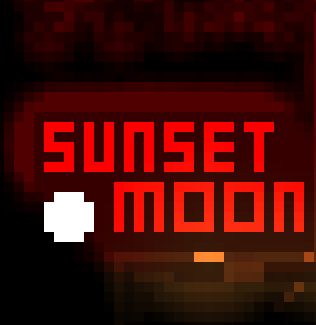 Sunset Moon - In A World Without Sun, Can We Ever See The Light? These things belong in the official thread, if you make multiple threads it really clutters things. Questions are for questions about the game. Questions about a server goes in the thread.